In both institutions the key motivations for transitioning to e-assessment were very similar. The cohorts for 1st year service mathematics courses (for non-mathematics specialists) are very large (up to 500 students) and contain very mixed abilities, experiences with and attitudes to mathematics. With such large groups and stretched resources it is difficult to have regular assessment with timely and constructive feedback. Hence, students lacked regular formative feedback on how they were doing and what they needed to improve on. Numbas is an open source tool with a large community of users and an extensive bank of resources. We wished to investigate if using Computer Aided Assessment (CAA) would help alleviate some of these problems. We also wanted to understand if using CAA would improve the students’ experience of mathematics. CIT first heard of Numbas when Julie Crowley (O’Donovan at that time) went to the CETL-MSOR Conference in Coventry in September 2013. In May 2014 CIT hosted a workshop on Numbas, given by Bill Foster and Christian Perfect of Newcastle University. In attendance were Tom Carroll and Kieran Mulchrone from UCC. Following the success of the workshop the TEAME group was formed and a decision was made to apply for funding from the National Forum for Teaching and Learning. We settled on the use of Numbas because it has a strong reputation, is user friendly and is compatible with the Virtual Learning Environment, Blackboard, used at both campuses. Numbas is an open source tool with a large community of users and an extensive bank of resources. In UCC Numbas was used in MA1001 (Calculus for Science Part I) in Semester 1 2015. There were approximately 500 students and Numbas was used to provide practice exercises where students could test their understanding with immediate feedback and also it was used for continuous assessment online examinations. Unlike CIT it was not possible to supervise examinations in small group sessions and we decided to use an allocated time slot where students could take the exam either on university computers or their own laptops. Students were given instruction on Numbas in tutorials and a video was produced which stepped them through the process. We’ve found that use of Numbas has increased student enjoyment and engagement with mathematics. Is the project well received by staff? The project has been very well received by the staff in both institutions. “I think that overall Numbas is a useful and valuable teaching aid, that encourages student participation”. Is the project well received by students? Student responses to Numbas have generally been quite positive. In surveys carried out as part of the project a large majority of students were positive about the introduction of Numbas. Instant feedback and usability were two particular aspects that seemed to appeal to the students. We’ve found that use of Numbas has increased student enjoyment and engagement with mathematics. [The students] attend more and do more revision in my experience. Numbas is embedded in module descriptors for modules in both institutions. This means that its current usage will continue for the foreseeable future. As other staff members are seeing the benefit to both themselves and the students of using Numbas we can only expect rollout to continue. As well as implementing Numbas in our own institutions we also put a lot of effort into the dissemination of the knowledge and experience we have gained over the course of the project. 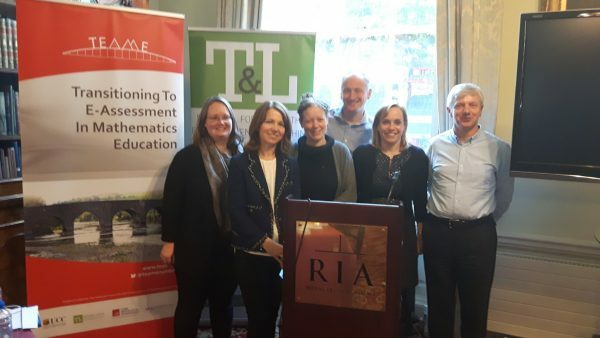 We produced an implementation guide to help other Irish institutions to transition to mathematics e-assessment and this was circulated to mathematics departments all over the country. We have had great interest from other higher education institutions in Ireland and have held talks or workshops at the Institute of Technology Sligo, University College Dublin and Maynooth University. 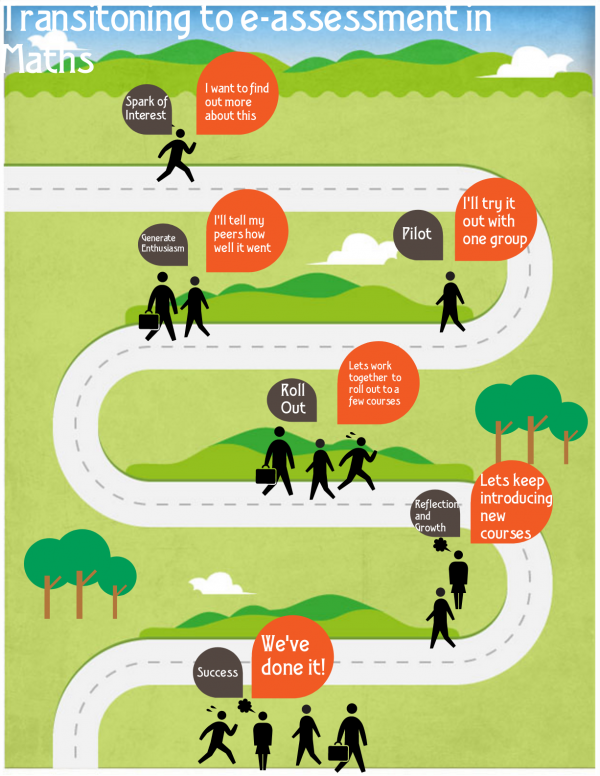 Find out more about the TEAME project on their website, teame.ie. As well as individual case studies for UCC and CIT, the site contains a series of pages on how to begin using Numbas for e-assessment, and resources including ready-made Numbas tests and papers about the project. This case study was provided by Deirdre Casey.